SNAPMapper, our mobile "Yelp for food stamp users" app, took third (out of 24) at the Alameda County hackathon last weekend. There was a fantastic amount of creativity and great ideas, all geared towards improving services and access to services for the residents of this huge urban and suburban area. Currently, people on the state CalFresh and Federal SNAP food assistance programs can find only the location of stores that accept this payment service; the data says nothing about quality, service, availability of fresh food, etc. (that is, the nearest three places may be liquor stores and gas stations). SNAPMapper allows users to locate, rate, and give other feedback about these stores, helping all users learn where they can find healthy, fresh, and inexpensive food for their families. We also hope that this would provide incentive for stores to stock healthier food. Our data can easily be scraped for the county to match against its own demographic data about CalFresh and SNAP users, to track the efficiency and availability of services. Since the data we used is nationwide, SNAPMapper could easily be adopted by every county across the United States. We look forward to working with the county to make SNAPMapper a fully functional web and native app. The live version of this is here. Once I add the slider (and get it working), then comes: changing it all to JQuery Mobile, customizing the styling and theme (are those substantially different terms? ), and starting to learn Phone Gap. The ultimate goal: This will be part of a public-good project that offers mobile phone users easy tools for visualizing how much each purchase will cost when credit card interest is factored in, for helping users learn how to pay down credit card debt, and about credit card terms and conditions. Belated notice on this, but go read my new(ish) article about the design challenges facing the iPad as an e-reader. It's up at UXMag.com. I was honored to be a judge at the 2012 Code for Oakland Hackathon in downtown Oakland, along with City Council members, local businesspeople, and technology developers. There were some amazing projects for a one-day event! See the Storify story here. By now I'm used to new versions of OS X inserting the latest and greatest into the Dock. This time, the first boot of Mountain Lion populated my Dock (which is pinned to the side in its 2D glory, as it should be) with icons for Launchpad, Notes, and Reminders. As a result, there are more shiny objects, making the Dock objects I use for launching or switching apps even tinier and smaller to hit. So I tried dragging Launchpad out of the Dock, expecting it to vanish in a puff of virtual smoke. (I should note that this is an expectation that Mac OS X has taught me.) But no go. The Launchpad icon just rubber-banded back to the Dock. Same with Notes and Reminders. Are we stuck with Dock spam? Well, no. You can still click-and-hold (or right-click) on these Dock icons, navigate Options->Remove from Dock and there you go. But... why is this the case? Why is Apple breaking behaviors they taught us? Is this a subtle signal that Launchpad will be the way of the future, and Apple is training us to rely on Launchpad? Is this another hint for iOS-ification conspiracy theorists? From, of course, Jack "King" Kirby"
I saw some apps not responding, so I tried to sample the processes (so I could hand the data off to a more savvy friend). Note that in neither of these screen shots was the cursor over the highlighted Time Machine Menu Bar item; I'd clicked on it in an attempt to suspend backing up, in hopes that that would lessen the load on the poor laptop, but that just made things worse. The whole thing started when iTunes wouldn't launch, so after a few minutes of the icon bouncing in the Dock, I used Activity Monitor to get it to quit. The next dozen times I tried to relaunch it, there was that lovely error message. The computer sat like this, with eventually the Finder being unresponsive, for 10-12 minutes before I forced a reboot. I was lucky enough to attend the Wall Street Journal Data Transparency Weekend hosted at NYU and work with a fantastic team led by Prof. Ed Felten of Princeton (and the FTC). The project was very data-driven, so the UX work came at the very beginning and the very end: If our concern was surfacing privacy and surveillance issues to users, how can we build the needed database and then present the relevant information? Could we assign a letter grade to sites based on our desired criteria of third-party cookie use, adherence to Do Not Track requests, and allowing users to opt out? Looking at the user needs, we didn't want to provide a site or app that users had to visit separately, load a URL, see the results, and then decide whether to continue or not their everyday browsing and interactions. We realized we could build this as a browser extension; this would be unobtrusive but persistent, and could be hidden or exposed (we later added automated presentation of the site's "grade" in the extension icon, so users could immediately see the site's letter grade). This, we hypothesized, would more powerfully link the experience of visiting a site with knowledge of the site's privacy attitude. It was our hope that this would more likely spur user action based on a state of information, making our extension an effective sousveillance tool. We performed these different crawls to analyze if the sites honored opt out cookies and/or “Do Not Track” requests from the headers. Based on these crawls, we graded the top 500 Alexa sites and relevant third-party networks. Raw data from the crawls will be located at trackingcookie.info in the future for reference. The current iteration of the extension presents this data in a three-pane column view. The left column shows the first-party site name, favicon, Yes/No to the presence of third-party cookies, and a graphic summing up the grade for the first-party site. The center column lists the names and companies of the third-parties (if any): even if users aren't interested in seeing details, a quick glance gives visual indication whether there are any, a few, or many. More advances users can click on any name listed in the center column to progressively reveal more data about each third-party, including details how it scored on our grading criteria. And, as said above, non-technical users can still see, even with the extension hidden, the letter grade as highlighted in the extension icon in the browser's status bar. More information and the download link for the current extension are available here and here. We also sketched out future direction. We'd like to incorporate a subset of the Mozilla Collusion plug-in to replace the center column with a graphical representation of the discovered third parties that shows their scope and relationships. Users would still be able to progressively disclose or ignore details in the third column. Vodka-brand vodka and tinned "Steak". In the same bin in, I assume, the freezer. Why would one put tins of meat in the freezer? Funny thing that negatively affected my enjoyment of "Fringe" in general -- for all the dialog notes that the world was falling apart, and things like water, clean air, and pens (?) were rare, almost every interior or exterior shot showed a world full of well-dressed and shod people in lovely houses. Apparently these hellish dystopias have higher living standards than 99% of our own world, which I don't think is all that bad. From the Season 3 finale of "Fringe"
In the two years I've had this Macbook Pro (basic model), I've had to restart maybe a half-dozen times total, with only two force restarts. That is, until I upgraded to Lion. Problems with the new Mail UI aside (the old Mail with WideMail could show half again as many items in the Inbox at once), I've seen serious RAM usage and have had to force restart twice in the last week. Any suggestions? I've booted from the install DVD I made according to Apple's own instructions and run Disk Utility and tried to make sure I have current versions of all apps. Note that only three apps are running, and over half my installed RAM is Active. One more app and the OS starts going to my hard drive for memory. I tried logging out to clear the RAM use. This is what it looked like for 10 minutes. I had to force restart. Charlie Pierce's work is vital and must be read. But the Esquire designers could bump up the left margin in their style sheet (Note: black bars show actual reading experience). Despite what you see, I do have files on my Desktop. Lion seems to forget this on occasion, and can take minutes to remember. 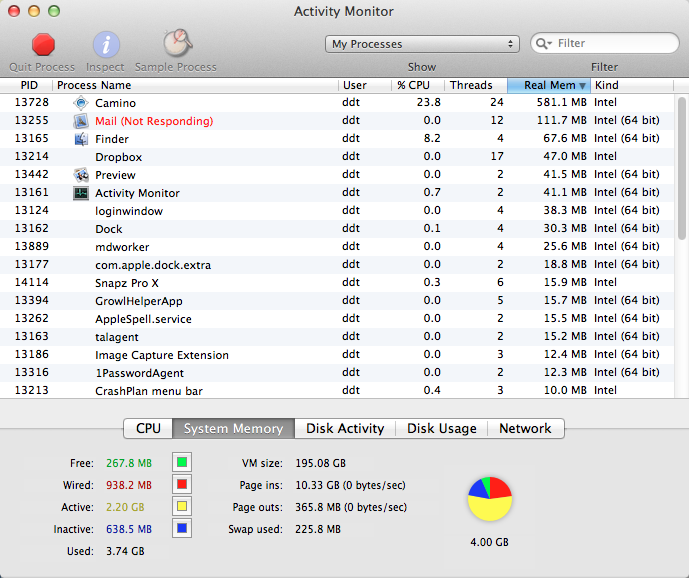 I am not loving the Lion Mail.app. Aside from the fact that it means I can see far fewer messages in my Inbox, it's been slow and now it's hanging for 10 minutes. 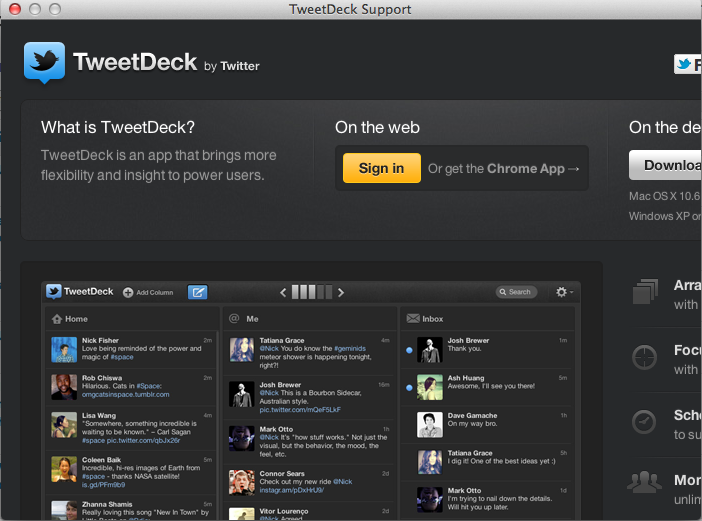 The first image is the full pop-up window you get when you click on the TweetDeck upgrade link from within the TweetDeck desktop app. Note how the window is not sized well for the content. Not even nearly. The second image is what happens if you try to resize the window. Granted, part of the problem may be OS X Lion's lack of window chrome (boo, in of itself), or that this is an Adobe AIR app. But did nobody test this? Especially ironic is that this makes it really difficult for the user to GET YOUR PRODUCT. Yet Another Offensive Aspect of "Homeless Hotspots"
Let's put aside the obvious patronizing and exploitative features of the BBH-marketing-firm-driven "homeless hotspot" stunt. That's an exercise left to the reader. What I want to focus on are the assumptions, stated by BBH's Saneel Radia on Marketplace, that (1) this is simply using the Street Sheet "model" and (2) that the point of writing, editing, printing, and distributing a newspaper by the homeless and about homeless issues is all about... getting a wee bit of social interaction. What we're doing is we're taking a model that exists already -- street newspapers. It's really that social interaction point, the ability for them to express themselves, to be a bit entrepreneurial. Again, if you really get into the experience, it is the opposite of condescending. It's very empowering, actually. I call multiple, steamy layers of BS. Have you ever read Street Sheet? It's usually well made, insightful, and brings to attention issues affecting millions of people that you don't see on CNN. Just recently, the San Francisco-based Street Sheet collected position statements from candidates for District Attorney, had been active in the issue of making MUNI (local public transit) free for youth, and been on the scene at various Occupy protests. Hey, marketers: there's value in content, and content is not fungible. Also, the process of reporting, writing, editing, producing, and distributing an actual product (as opposed to, say, doing whatever marketing firms do) keeps a person's mind sharp, which is hard to do when you can't afford an iPad or are engaged in daily work beyond survival, and provides skills and job training. There are many stories of homeless people pulling themselves up, as the saying goes, through the work street newspapers provide. So, those are the "models" street newspapers provide. You think all a homeless person wants is to be graced by your patronizing presence for a few moments, in exchange for a few pennies? If you want to know the true measure of someone, it's all about how they react when things aren't going their way. By now, the one thing we really know about Romney as a person (aside from the fact he's fabulously wealthy, to the extent that he and his family are almost on another, gated, branch of the evolutionary tree) is his ability to say jaw-droppingly awkward things when forced to talk to, you know, people. The examples are legion: "I like grits", "the trees are the right height", "who let the dogs out? ", "garbage bags", and many, many more. What's in common in these gaffes? Why can we almost see the "I need to note something about an individual or locality, express that I see it, and say that I, too, am that" app load screens come up on Romney's main display? Of course I'm guessing here, but I think it can be traced back to Dale Carnegie's "Six Ways to Make People Like You". My sense is that this framework is still floating around management training courses that were the Petri dishes Romney swam out of at some point, and since a small use worked once for him, he's upping the dose in order to Make It Work on a large scale. The problem he doesn't see is that it doesn't scale, and it doesn't work when you can't pull it off. Six ways to make people like you 1. Become genuinely interested in other people. 2. Smile. 3. Remember that a person's name is to that person the sweetest and most important sound in any language. 4. Be a good listener. Encourage others to talk about themselves. 5. Talk in terms of the other person's interests. 6. Make the other person feel important - and do it sincerely. We can give him a partial pass on #4, as most of the interactions where the Romney suite of apps fail are not interactive, but variants on PowerPoint -- that is, he's presenting, not collecting data. Though his "I give the answers I want" moment near the end of the 11,432nd CNN debate is a fail. And really, not something you want the leader of a nation to be in the habit of saying (accountability is A Good Thing). As for #1, well, empathy to strangers wasn't in the original design specs for Romney. And, again to be fair, it's a hard thing to ask given the nature of a campaign -- though Bill Clinton was amazing at it (I once heard him at a mall greet of thousands of people, and when someone said he was so-and-so's old roommate, Clinton knew who he was talking about, and asked him personal questions about their mutual friend). #2 is an interesting case. Of course it's good to smile when you meet people. But again, Romney has taken the "it's good, so more is better" idea to the point it stops working. Or maybe he's afraid that dropping the smile will dock his relatability and likability rating even below that of, say, an STI. Take a look at how Romney holds on to that rictus in tough situations -- being pressed for answers, being challenged in interviews or debates. Is he trying to signal "I'm above this attack", or "this doesn't bother me"? I suspect someone once told him that Carnegie's #2 was key -- because the business world is small, and even if you screw someone over in a deal, you want them to think there's a chance it wasn't personal, just a game, and that there's so little bad blood between you that they'd be willing to get into a position for you to screw them over again. The meat of it is a combination of #1, #3, #5, #6, and the special sauce of trying to show that one can relate. The problems arise in that a) Romney is not genuinely interested in these other people and b) he tries to combine #5 and #6 by saying "I do that, too" -- but not only does he not, he doesn't realize that replacing "that" with his closest match is not a viable substitute. Just type "Romney NASCAR" into your favorite search engine and you'll see only ridicule about his comment -- at a NASCAR event -- that though he's not a big fan, he has "some great friends that are NASCAR team owners". This is a great example of the big fail of blindly applying Carnegie's rules. If he were honest, he could say something like, "I've never been to one of these -- it seems cool! Tell me more about it?" People actually love sharing their interests and passions -- if you're American, go to a pub during the World Cup, buy a pint, and ask someone to explain what they love about soccer (excuse me, football). But Romney was programmed to show that he already shares your interests, and that Your Concerns Are My Concerns, Too, So We're The Same. And that this will lock in someone's vote. What's worse about this, aside from seeing the last dregs of someone's soul evaporate before your eyes, is it signals not just a lack of true care for individuals (to be fair, who can really care about every random stranger one meets when one is faced with hundreds, if not thousands, of them on a daily basis for months and years on end? ), but the worldview that people are fungible products, means to an end, and not an end in themselves. They are assets to be collected and traded in for what you really want, stars or rings that'll add up to a power-up in a video game. It's an asset manager's view of citizens, and a blind application of a limited algorithm. And what's even worst? What this shows is a blind application of learned rules, not the ability to think critically and rigorously. It's the same as a student turning in lecture notes about a Shakespeare as an original paper. This actually happened to me, as did the student asking, "Why, isn't this right? It's what the professor said -- are you saying he's wrong?" At some point this tactic worked for Romney, so now he's applying it. The goal is bigger? More cowbell. This does not seem like a winning strategy for the leader of a complex, contradictory, nation. My first-ever iPhone app icon! Climatix grew out of a project begun by Robb Miller and Nick Orenstein at a green technology hack. The goal was to enable users to visualize, at a personal level, the vast but arcane data available about air pollution, power plant emissions, groundwater quality, as well the carbon footprint of facilities they may see every day. All this information is currently in open databases; it's there for the taking, but nearly impossible for the average person to make sense of. Security through obscurity, in a way. 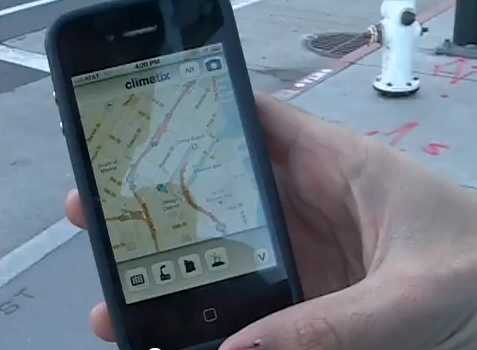 The Climatix mobile app allows users concerned about environmental (policy, development, social justice, zoning, and health) issues to explore their world in a familiar and interactive way, seeing in real(ish) time the environmental and energy usage hot spots around them, or wherever they search. Not only can users use a familiar map interface, but Climatix's augmented reality (AR) interface, built on the Layar API, shows users these hot spots within the real world, and how to get to -- or avoid -- them. Users can also add to the environmental data in a unique way. If a user sees a potential point of concern, whether it's a suspicious dump, a wasteful business, or leaking pipe, he or she can take and upload a photo to the Climatix app. This pins real-world experience to formerly abstract data and can teach all users of the Climatix app the cost of pollution, or uncover hidden sources of it. This is a great tool for: individuals curious about their local environment, urban planners, local/state governments that want a better sense of where they need to focus their scarce resources, real estate developers, health researchers. Most of what affects our lives and health -- air, energy waste, toxins -- is invisible. The Climatix app allows users to see this hidden world, and help uncover it further. See Climatix for more information.